A few hours of travel brought us to Pakil, Laguna, where a church which prides itself to remain as authentic as it was built centuries ago is located. It stands just a few meters beside a river and in a very narrow street – its front filled with souvenir and merchandise stores not to mention basketball court. Laguna is home to the most renowned sculptors in the Philippines and so as expected, every inch of the church, be it made of stone or wood, as long as there is sculpture, it was delicately labored by the artists of the province. 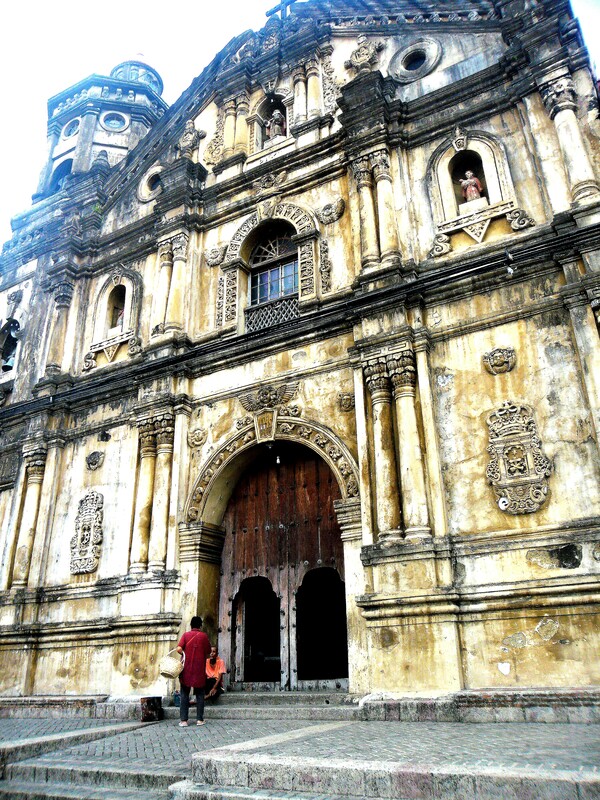 St. Peter Alcantara Church is old but strong and sturdy, the altar magnificent. Maybe because the churches I’ve been in Bulacan and Manila aren’t made like that, I was silently in awe when I saw not one, nor two nor three images of saints in the altar but fourteen icons. 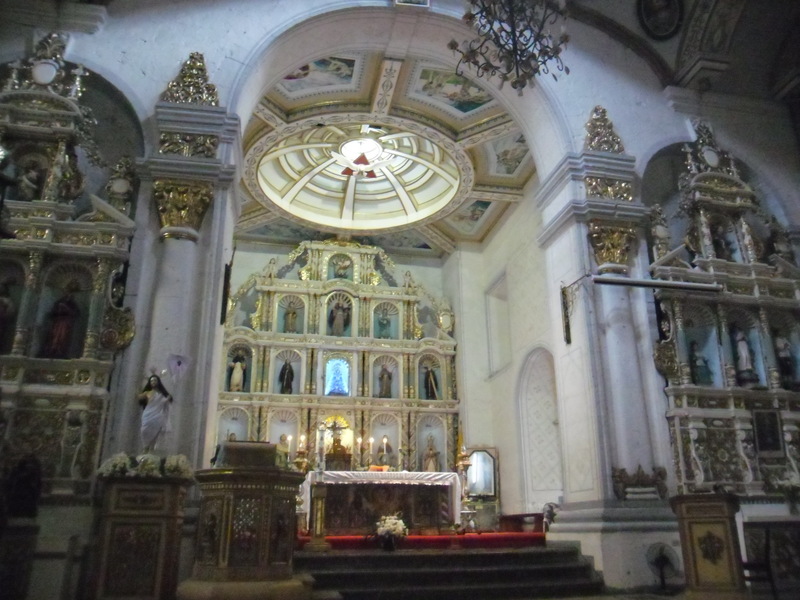 Let me be loose in saying that the main altar looks like a collection of dolls in boxes. 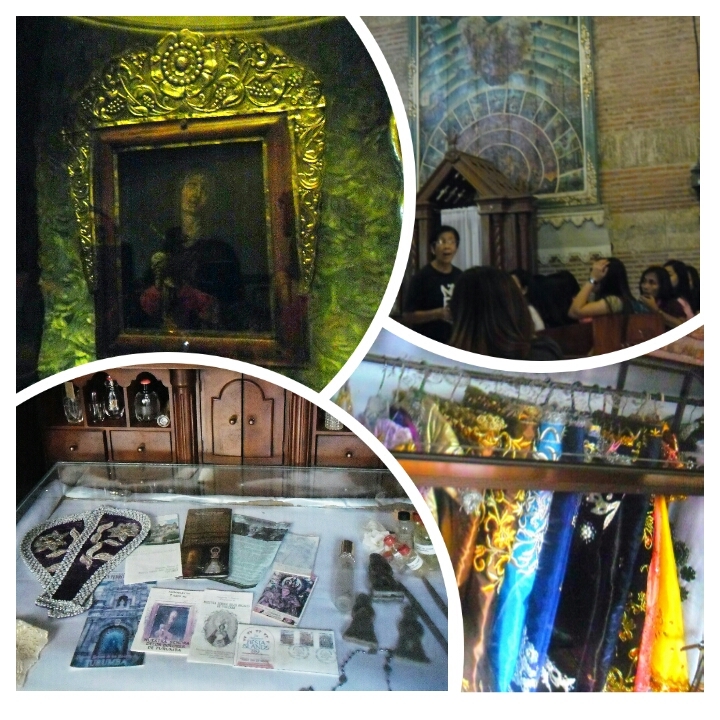 The century-old images at the main altar. We spent a great deal of time listening to a devotee of the Virgin Mary, telling stories about the church and its history. This church houses the image of Virgen of Turumba. There is also a 9×11 image of the Virgin Mary at the second floor which, according to the parish priest himself, doesn’t want to be photographed on some occasions. It is said that when once captures a comprehensible photo of that image, that goes to show that the photographer has a good heart. Otherwise, you know the drill. Some parts of the ceiling and walls are already corroding but the church decides not to have it renovated or fixed at all as they want the authenticity of all aspects of the church preserved. It is till so safe structurally since processions are still done up to the top of the church. For it to hold that weight frequently says a lot about its stability. 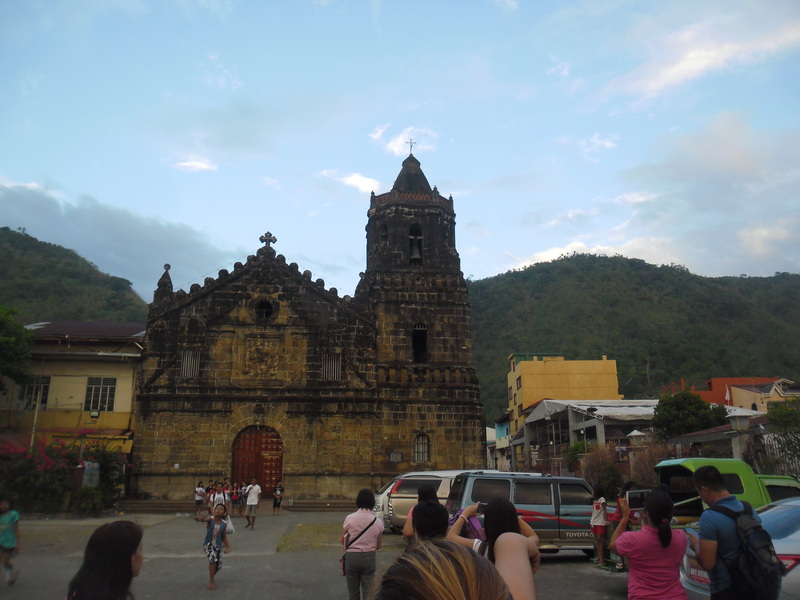 A few minutes from Pakil, we headed to nearby Paete, Laguna. We did a bit of walking since our bus cannot get in the narrow streets leading to the church from the main road. It was about dawn and the church’s main front door was closed. We entered through the door on its right side. A mass will be starting in a few minutes so we hurriedly took group pictures and uttered our prayers in front of the image of the Risen Jesus which was beside the altar. There is an image of Jesus which the locals bathe in an alcoholic drink called “lambanog”. The “lambanog” is then consumed by the people after. Its cloth is also cut into pieces and given to the parishioners and pilgrims thought that time that we came, since it was not a week after Easter Sunday, there wasn’t any available. Me holding the book, “”. Before I started in our ministry, I didn’t even know what Triduo means or that the image at my back is that of the Risen Christ. 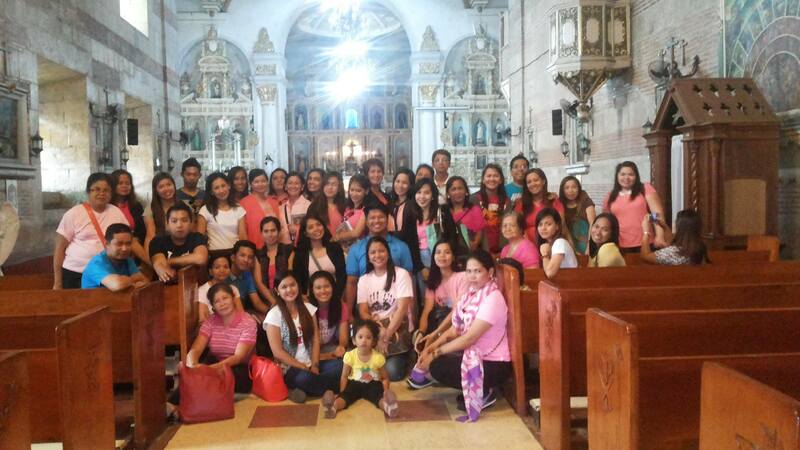 Saint James the Apostle Parish became our last church to visit. We were supposed to visit one in Baras, Rizal but it will already be very late by the time we get there and we may not be allowed entry anymore so we just started our way home to Bulacan. 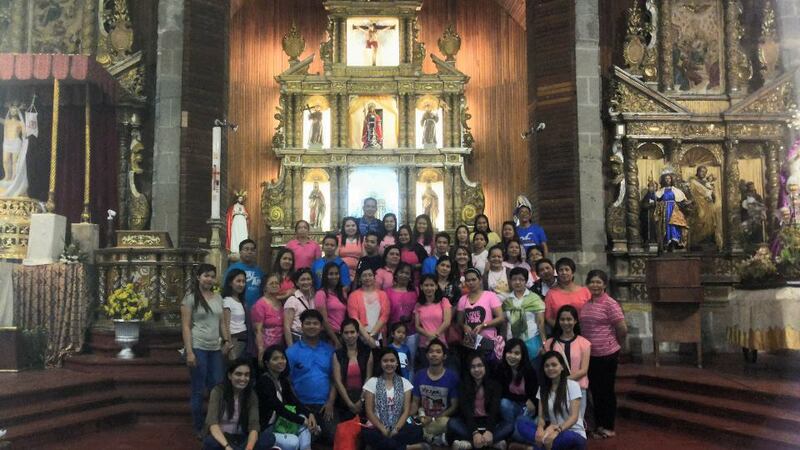 So what did I learn about pilgrimage from an entire day spent in church hopping? Before, I thought pilgrimage is only to the Holy Land. I didn’t think we can do pilgrimage in the Philippines. Apology for my ignorance but I’m just being blunt about it. So for lesson number 1, every place can be holy. It’s especially true for churches where two or more people meet everyday getting in touch with God, God is in it. Maybe the same spirit which called me to be a lector inspired the painters, sculptors, engineers and architects who built the church lots of years ago. Maybe that same force allows the parishioners to maintain the cleanliness of the churches, to keep the altar adorned with flowers and keep those churches operating still despite and in spite of every thing. Lesson number 2. Prayer is still what makes a pilgrimage. Visita Iglesia sometimes become “Rampa Iglesia”. Sometimes it’s meaning is reduced as part of a tourist itinerary. The priest in Regina RICA asked during the homily, “Why are you here?”. A pilgrimage is a spiritual journey with the Lord through things that are visible and tangible. It’s about searching for Him in places unfamiliar and finding Him walking beside us all along. 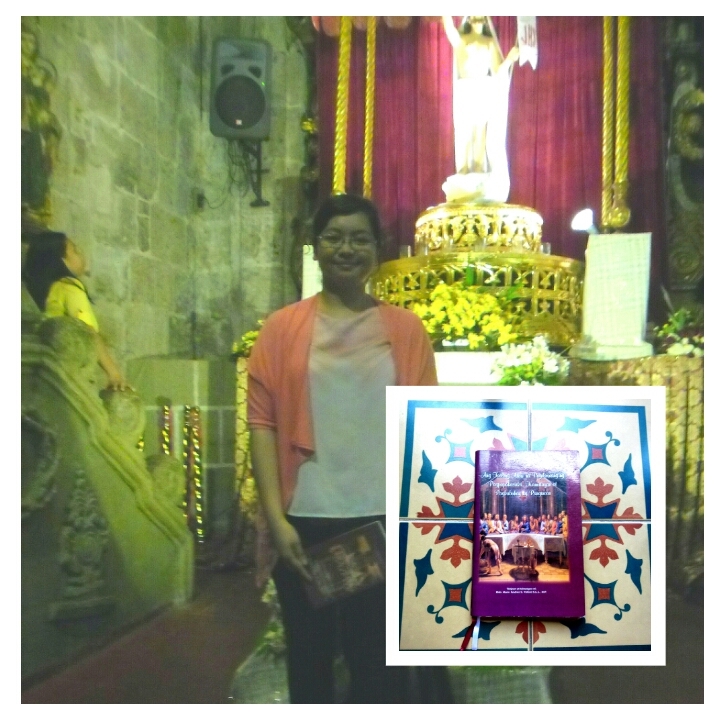 Every step was a prayer, every marveling at paintings and icons were prayers. Lesson number 3. Pilgrimage accents the need of humans for miracles – for cancer to be cured, for loved ones to love us back, for pockets to be filled, for exams and schooling to be passed, for contest to be won, for few pieces of bread and fish to be multiplied a hundredfold. At one point, I am amidst a see of church goers and I thought, what were all these people telling God simultaneously. My answer: the same things I tell Him. More or less the things I need are also their needs. The sins I confess, those things I thought only God knows, might also be the things they ask forgiveness for. We are all in dire need of a saviour; for grandiose and minute displays of miracles and everyday salvation.